Last month we discussed selecting and growing tomatoes (Enterprise: March 29, 2012): when to plant, how to plant, which to choose. Many of you garden in raised beds, and those have special issues. And there are many other summer vegetables to plant! May is really our main planting month for summer vegetables here. Raised garden beds have some advantages. The soil warms up faster in the spring, which gets heat-loving vegetables, such as tomatoes, peppers, eggplant, melons, okra, etc., off to a faster start. It also allows summer vegetables to continue growing and producing later into the fall. Raised beds drain excess moisture faster. If you have heavy soil, that can help prevent root rot. The loose soil that you fill it with is more suitable for root vegetables. Beets, carrots, potatoes, radishes, all develop more uniformly. Older and less-abled gardeners find it easier to work without having to bend so far. 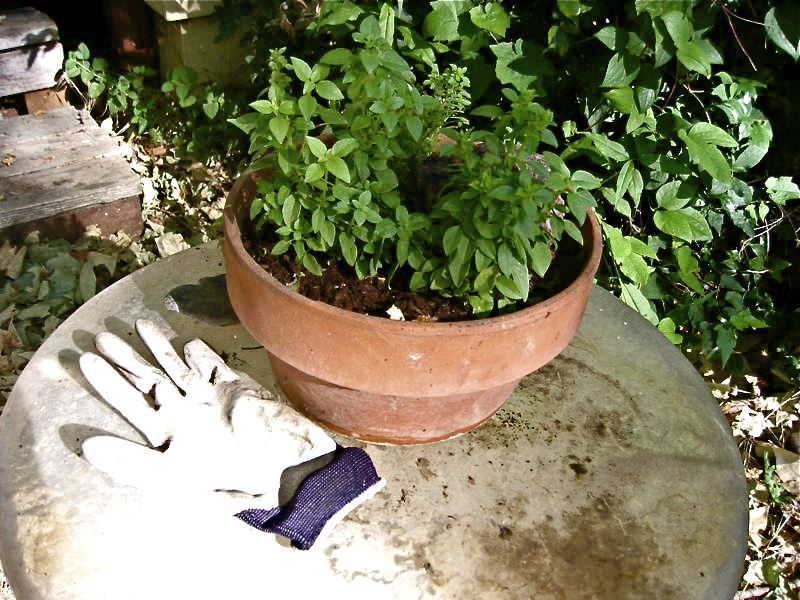 A sturdy top board can be attached to use as a bench for weeding and digging. From a design standpoint, raised planters can bring order to the landscape. Vegetable gardens get a little untidy as the season progresses. Landscape designers often like to separate the kitchen garden. An attractive raised bed can be an aesthetic improvement. Because the soil drains faster, raised planters need more frequent irrigation. What you fill them with makes a big difference in ease of management. If you use your native soil for all or part of the planter, watering won't be too different from what you're providing the rest of your garden. But if you import soil that is very sandy, or includes lots of peat moss or compost, it will drain out very rapidly. My experience is that raised beds need water twice as often as the rest of the garden. Water distribution can be a problem with faster-draining soils. Water so all the soil gets wet. Drip watering systems put out water slowly, and the water tends to go straight down. So emitters may need to be spaced quite close together to water thoroughly. Soaker hoses work very well. You need to run them for a couple of hours at a time. Some vegetable plants, particularly tomatoes, have deep roots. The bottom of your planter should be open to the soil below. A common mistake is to build a garden planter that is enclosed on the bottom. This is like trying to grow a tree in a pot: it can be done, but every aspect of watering and fertilizing it requires more work! The popular Square Foot Gardening technique, which uses enclosed garden beds, can be a real challenge in our hot, dry climate. The soil you choose, and how you install it, is crucial. Non-native soil piled on top of native soil leads to problems. Water rushes through the stuff you bought, and when it hits the denser soil below it slows and that soil gets saturated. Roots won't penetrate. It is important to amend your added soil with your native soil. Turn the native soil. Pile on a few inches of what you bought. Dig that all together. Repeat. What you want is a gradation as the roots and water penetrate, rather than layers of different soil types. Clay loam soils (such as we have in most parts of Davis) retain nutrients (i.e., plant food) much more readily than do soils that are high in soil and/or peat (for the record: I don't recommend peat moss as a soil amendment). We frequently encounter chronic nutrient deficiencies in plants growing in raised planters. Plant food leaches out more rapidly due to the frequency of watering, and the artificial soil you brought in doesn't retain it well. So it is necessary to improve the natural fertility of the soil. Add at least an inch of good quality bagged soil amendment each planting season, preferably containing some manure and other organic fertilizers, to provide a steady supply of plant nutrients. You will also want to add small amounts of starter fertilizer with each young seedling. Most of your summer vegetables need even soil moisture. Drought stress slows growth, causes flowers to drop, and young fruit may stop developing. In a regular garden bed, water every 5 to 7 days, providing a good thorough soaking that penetrates a foot or so deep. With a drip system or soaker hoses, that means watering for 2 to 4 hours. But your tomatoes are an exception: they have much deeper roots and will yield better and have better flavor if they are watered less often. So in my garden, everything starts out together, getting water about twice a week for a couple of hours. But once the tomatoes are a couple of feet tall, with flowers and young fruit, they get watered about half as often and about twice as long as everything else. I accomplish that by having a "Y" coupling at the start of the valve, enabling me to control the tomatoes separately from the other parts of the garden. Summer gardening isn't just about tomatoes! It's time to plant peppers, eggplant, and other heat lovers. Here's a quick review of some of the popular summer vegetables. Beans: the "bush" types of green beans can be planted every 3 to 4 weeks through July for harvest all the way into fall. Pole beans yield more per square foot so long as you are consistent about picking them. If not, they stop producing. Avoid Kentucky Wonder variety, as it isn't heat tolerant. Peppers and eggplant: bell and other sweet peppers, planted now, will yield heavily August through October. 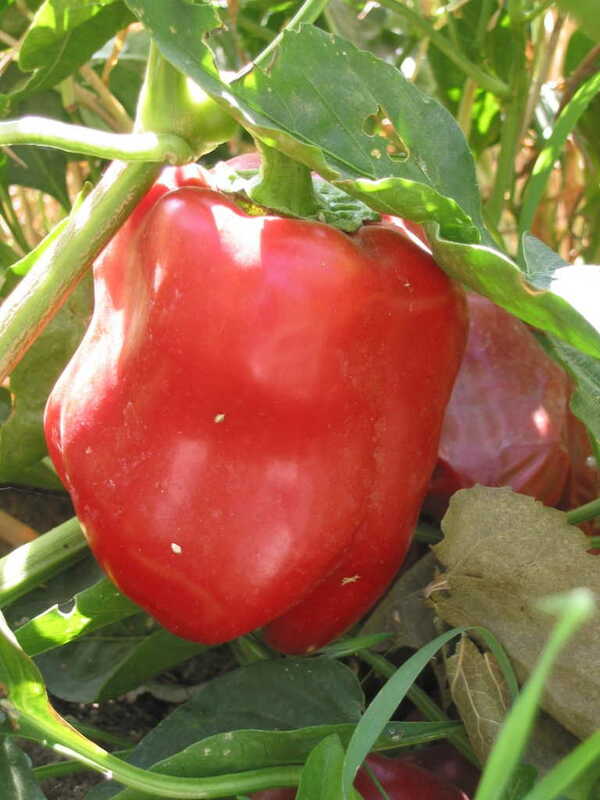 All sweet peppers will turn red as they ripen on the plant, and get sweeter as they do so. 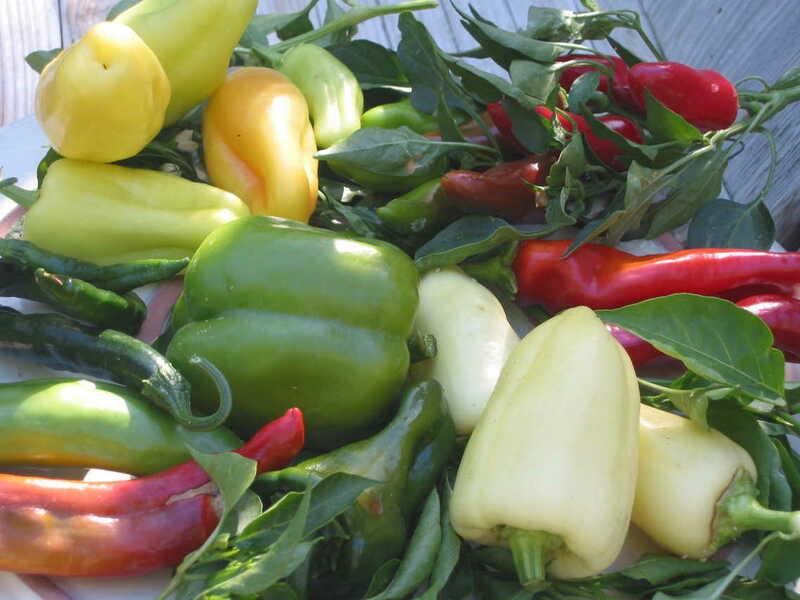 Hot peppers that we use fresh, such as jalapeño and habañero, may be ready as early as August or September. Those we grow for drying, such as cayenne and Thai peppers, need to ripen further, yielding large quantities in October and early November. 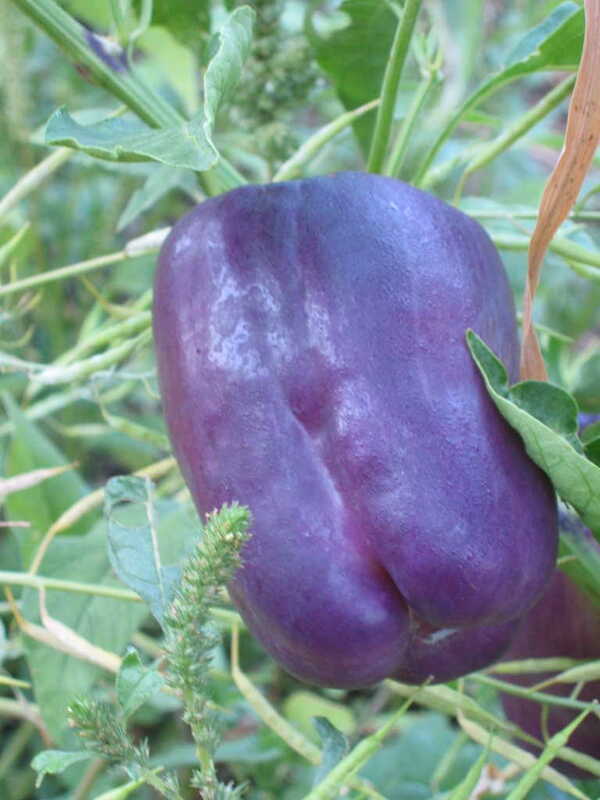 Eggplants take longer than peppers to yield. The plants are bigger (3 feet tall and broad). The narrower and smaller fruited types yield more heavily and earlier. Peppers and eggplant grow best with soil that has been amended with compost and organic fertilizer, and should not be drought stressed. Cucumbers, melons, pumpkins, and squash: All are rambunctious vines, some of which we grow on the ground, others up on fences or trellises. The cucumbers I don't recommend here are the standard green ones, because they get bitter. Lemon, Armenian, Mediterranean, and Burpless varieties all do well and seem to avoid the bitterness. The melon I would not be without is Ambrosia, a type of cantaloupe. The flavor is, well, ambrosial! Nothing compares with it. Other melons, including watermelons, require lots of room and don't give that much yield. For a compact grower, look for Sugar Baby. Pumpkins take a lot of space. I suggest pie types, which give more fruit in a small area. There are lots of types of summer squash, and many yield better than zucchini! 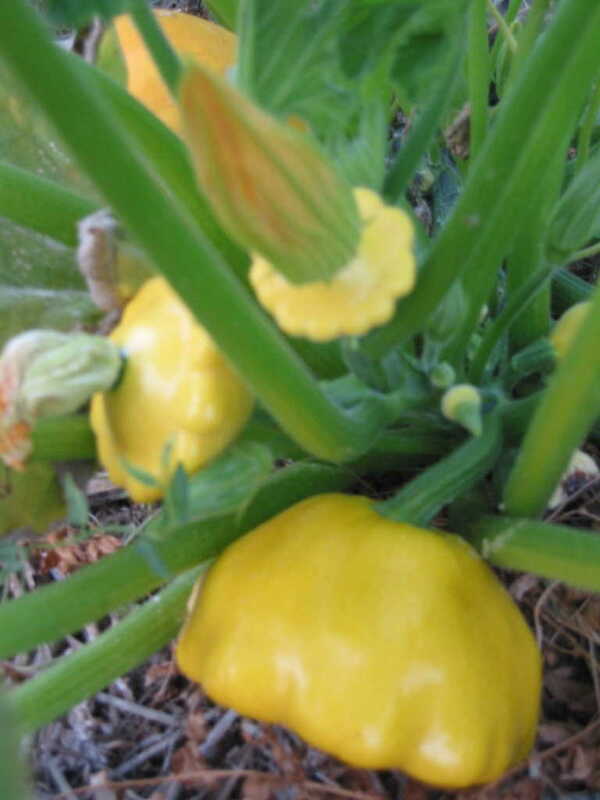 I find Patty Pan, or gourmet varieties like Tromboncini, more satisfactory. Of the zucchinis, Gold Rush has the advantage of being visible down in the leaves (the yellow fruit stands out in the green foliage), so you can see to harvest them while they are still small. It is a bit more tender than standard green zucchini. Winter squash is a term that refers to the hard-skinned types we grow in summer and store for use in fall and winter: Hubbard, Acorn, Butternut These have fine-texturedure and are used for baking and for pies. Give them room: they will run all across your garden! I like to let them wind around behind other plants, up on fences, and across the nearby brush piles for a bucolic, pastoral effect. Sweet corn. Corn is easy and fast, but takes lots of room. Turn in lots of manure or other source of nitrogen; corn is a heavy feeder. Give it plenty of water. Plant in blocks, not rows, to allow the wind to scatter the pollen from the tassels to the silks. Plant a 4 x 4 foot block, with plants thinned to a foot apart, then do another planting a few weeks later. Each plant produces one ear, maybe two, and the whole block matures simultaneously, so plan accordingly. Repeated plantings through mid-July can give you harvest all the way into the early fall. My favorite is Silver Queen, a tender sweet white corn. There are extra-sweet types available, which to my taste are more sugar than corn flavor. Our most popular herb thrives in heat and can be planted all summer long. There are lots of types! Try some Spicy Globe bush basil in a pot, or large-leaved Genovese basil for pesto. 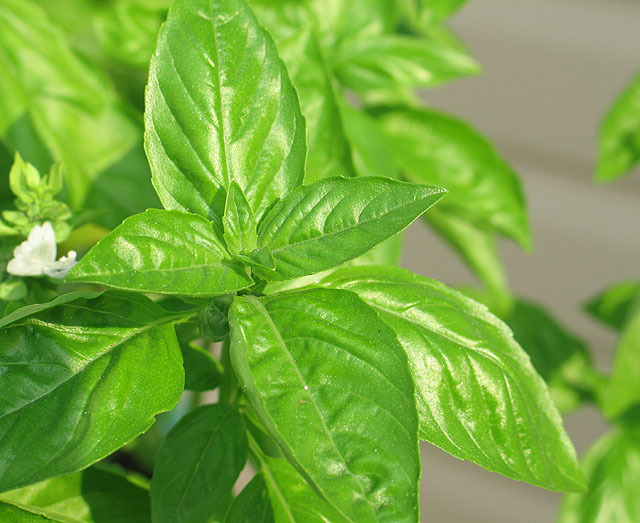 Unlike most garden herbs, basil is an annual: grow it in summer for fresh use, and be sure to harvest some in fall to dry or freeze.